Developmental abnormalities and skeletal dysplasias comprise one of the most controversial, extensive, and complex subjects in pediatrics. 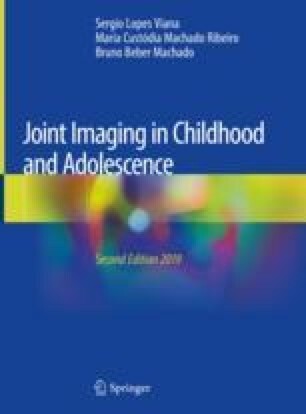 This miscellaneous chapter provides a concise review of imaging findings in selected conditions that are particularly prone to affect the immature joint. This selection is inevitably arbitrary and includes non-related abnormalities of the bones and soft tissues, based mostly in their frequency, clinical relevance, importance for the differential diagnosis, and potential impact of imaging for diagnosis and management. Pseudotumoral articular and periarticular conditions (such as focal fibrocartilaginous dysplasia and dysplasia epiphysealis hemimelica) are discussed in Chap. 7. Docquier PL, Maldaque P, Bouchard M. Tarsal coalition in paediatric patients. Orthop Traumatol Surg Res. 2018; https://doi.org/10.1016/j.otsr.2018.01.019. Neubauer H, Morbach H, Schwarz T, Wirth C, Girschick H, Beer M. Popliteal cysts in paediatric patients: clinical characteristics and imaging features on ultrasound and MRI. Arthritis. 2011; https://doi.org/10.1155/2011/751593.